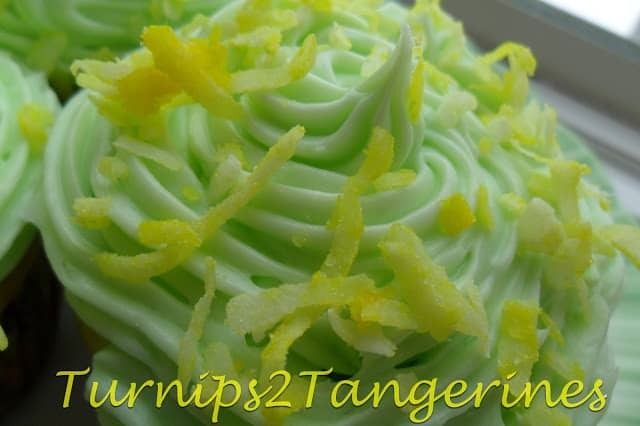 Lemon Lime in the Coconut Cupcakes are like Springtime in a Cupcake. 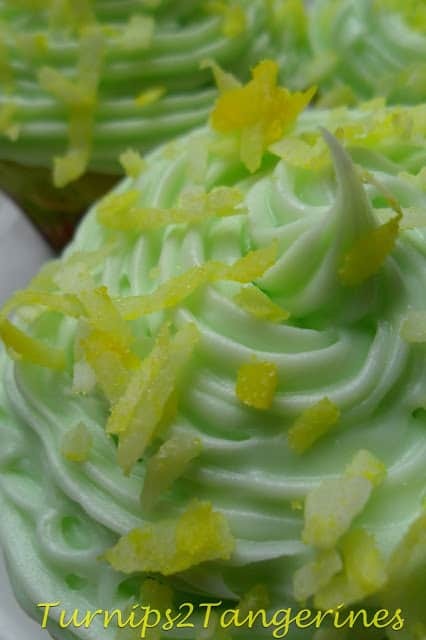 One bite of these delicious cupcakes and you’ll be singing, “Put the Lime in the Coconut” song. These delightful cupcakes are so refreshing. Perfect to serve in the spring or to serve after your Easter Dinner. 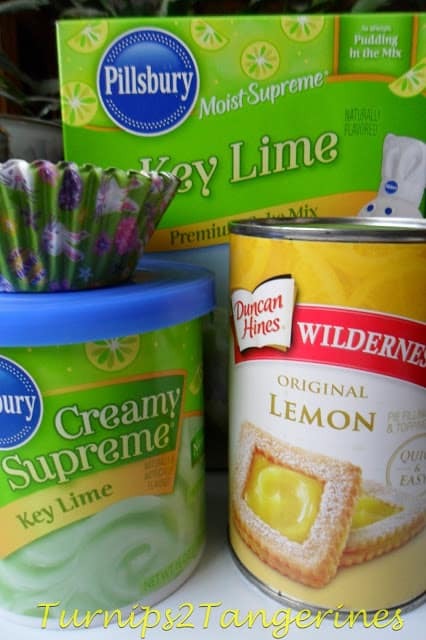 For this recipe we used three “Food Finds.” One package Pillsbury Supreme Key Lime Cake Mix, one container Pillsbury Key Lime Frosting and one can Wilderness Lemon Pie Filling. We have also include the ‘recipe’ for how to tint coconut. We tinted the coconut yellow using AmeriColor gel food coloring. All of the “Food Finds” we found are super fantastic. Heat oven to 350. Line a 24 cup cupcake pan with cupcake liners. Combine cake mix, water, oil and eggs in a large bowl until moistened. Beat with a mixer on medium speed for 2 minutes. 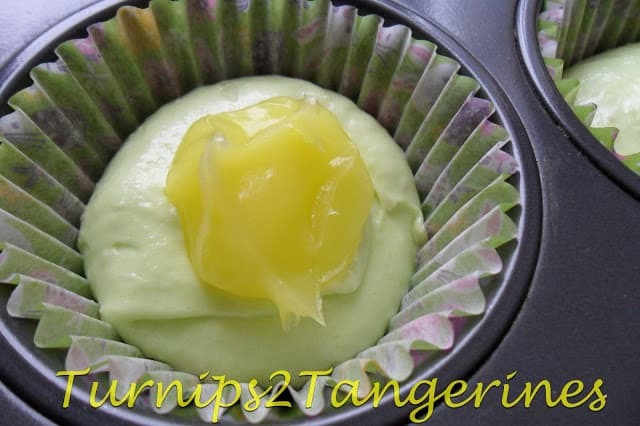 Fill cupcake liners 1/4 full, drop 1 teaspoon lemon pie filling onto cake batter, top with 1 tablespoon cake batter. Bake for 19 to 23 minutes. Remove cupcakes from pan, cool on wire rack. Place 2 cups coconut in a small bowl. Squeeze 1 to 2 drops yellow food coloring on coconut. 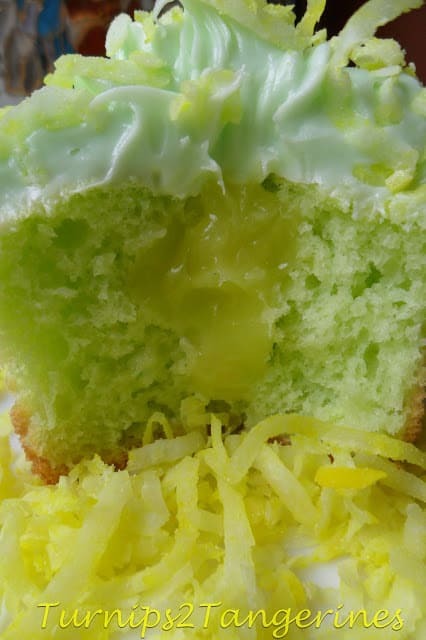 We love lemon and lime recipes. Do you? You’re gonna love these. Lemon Raspberry Bars, Key Lime Cheesecake Bars Lemon Meringue Krispie Treats. Plus many more! Pretty, pretty PRETTY! You are an amazing artist, Lynn. Amazing! I am looking forward to sharing this on Cupcakes on Parade. The readers will LOVE it! These cupcakes are gorgeous and certainly make us feel like spring! Love all the flavor combos – VERY nice! Thanks for sharing. Congrats on being featured at Tasty Creations! I want to buy good re seller hosting, a friend of mine recommended me http://www.elcoplanet.com have you ever heard about them. i have checked there web site and it seems that they offer chip prices and good performances unlimited web hosting space and unlimited bandwidth. I love the Key Lime mix as well! It's light and flavorful! Thanks for sharing these at Two Cup Tuesday at Pint Sized Baker. These look amazing! Pinning this and following you on Bloglovin from the One More time Bloglovin Hop! Oh, these look so yummy and perfect for spring, too! Just pinned. Thank you so much for sharing at A Bouquet of Talent. You are always such an inspiration! Hope you are having a great week. What a fun Spring cupcake! Thanks for Sharing at Show Me Your Plaid Monday's! Those look sweet and tart to the max! The coconut and citrus flavors are a winning combination in my recipe book. Thanks so much for sharing this with Foodie Friends Friday. 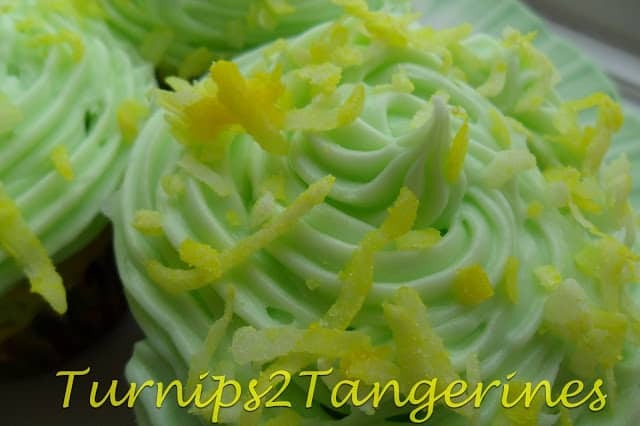 I can't wait to try these awesome Cupcakes, I just love the citrus flavors. Have a great St. Patrick’s Day and thank you so much for sharing with Full Plate Thursday. Thanks for sharing such a festive fun cupcake with us on foodie friday. Happy St. Patrick's Day. These look soooo yummy! Thanks for the recipe. PS – Meet & Greet is open for the weekend, if you'd like to join us.